Peace is a process, not a dream. It is waged within and without. It is the way to a just and equitable world, one that values cooperation, sharing, and open boundaries. Peace comes from many different perspectives and life experiences. It is multi-fold and complex. Peace de-escalates and co-creates. It is messy and chaotic. It is 7 billion (still growing) and diverse. 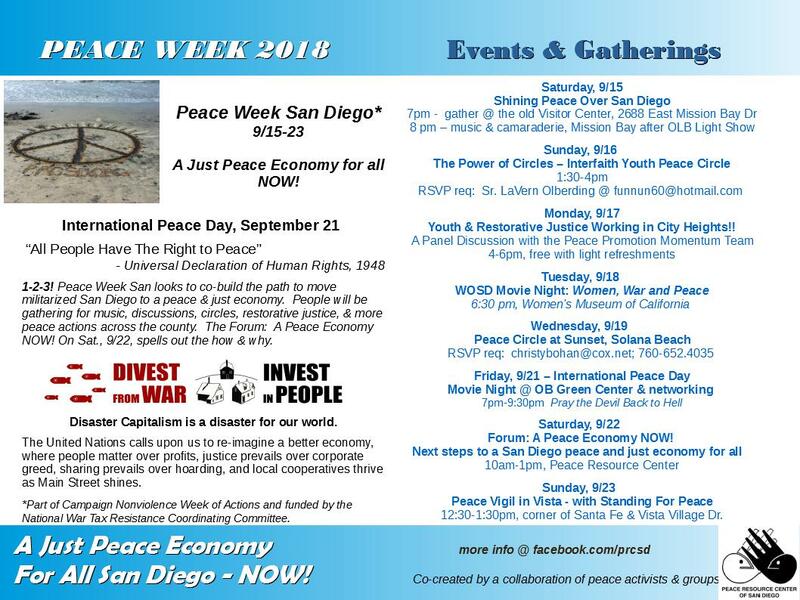 This year’s Peace Week Theme looks at the steps to transition from the militarized San Diego economy to a peace & just economy in a series of events around the county. We kick off Peace Week with Overpass Light Brigade and a musical peace social down on Mission Bay (by the old Visitor Center) and end the week in Vista with Standing For Peace. Saturday, Sept 22 – Forum & workshops at the PRC. Steps 1-2-3 to a Peace Economy NOW! Workshops & discussions by local experts and activists lay out the transitions as we move from a militarized police state to a democratic society. Local cooperatives, small business set-ups, resource-based economies, Divestment From War strategies, community oversight of law enforcement and local government, alternative economies, restorative justice and practices, and more! Bring your ideas to share. Basically, if it is too big to fail, it will! A Peace Economy – decentralized, localized, and de-bordered structures. Just added!! This forum will also be offered in North County on Sunday, Sept 23, after the Vista Peace Vigil. For a complete listing of Peace Week events, check our FB page. *All events are free to the public, Two require RSVPs. 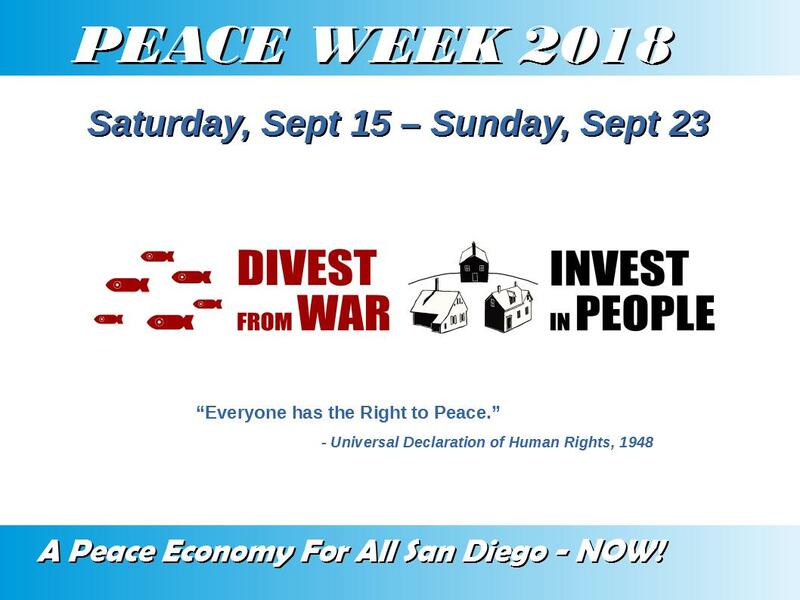 Peace Week 2018 is made possible by the efforts of hard-working volunteers and funding from the National War Tax Resistance Coordinating Committee. Cosponsors include PRCSD, FPC, WOSD, Pax Christi, OBGC, OLB, Peace Promotion Momentum Team/City Heights, Standing for Peace/Our Revolution. How do you wage peace?